Top ‘o the morning to you from Novomatic! Their Top O’ the Money slot is inspired by the Irish. Set in the Irish countryside, this 5-reel slot game is a real charmer. The typical Irish symbols set against the background make this slot feel quite like a folk tale! You’ll see green fields, blue skies, fluffy clouds, leprechauns, four-leaf clovers, rainbows and pots of gold. Leprechauns are a big part of Irish legend. In fact, they are so often depicted in movies, TV shows and books that some people think are real. Leprechauns aren’t real but they are lucky, especially in this slot game. The lucky leprechaun can pop in at any time and trigger a bonus feature that can pay up to 500 times your bet! On top of the big pays, you’ll love how it looks. The design is so detailed and so much thought has gone into everything. The reels are made to look like they’re wooden and each of the paylines are marked with a four-leaf clover symbol. When you trigger any of the special features, such as the tumbling feature or the free spins feature, the background and the reels start to change colour! Top O’ the Money has 20 paylines which all pay from both directions. The RTP is 96.05% which actually makes this slot one of Novomatic’s higher paying ones. 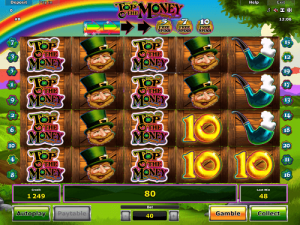 You can spot lucky leprechaun in these Novomatic slots, too: Irish Coins, Rainbow Reels and Lots o Luck. At the top of the paytable is the Top O’ the Money logo symbol. The leprechaun and his pipe pay out slightly smaller payouts. Less valuable are the violin and the pints of Guinness. Then, at the very bottom of the paytable are the card value symbols: 10, Jack, Queen, King and Ace. These symbols will appear on the reels along with the four-leaf clover Wild symbol. Payouts are given when you spin the reels and match up 3, 4 or 5 identical symbols. To get the payout, the identical symbols have to fall either from the leftmost or from the rightmost reel and then on consecutive reels, along the path of one of the 20 paylines. If there are any gaps, you won’t get the payout. The Wild symbol can help you get the payout if it happens to fall in a gap! That’s because the Wild symbol can substitute for any symbol. It’s the right place, right time sort of symbol! Normally, when you first meet someone, you notice their best features! Perhaps it’s their eyes, or their hair, their figure or even their personality! In this Novomatic casino slot game, the best features are the ones that give you big wins and free spins! The Colossal Reel Bonus can happen at any time, although it doesn’t get triggered very often. It’s totally random and you’ll love it when the leprechaun appears. The normal reels disappear and one reel with colossal symbols will appear in their place! The leprechaun will sit to the right of the reels and he spins it by pulling on the lever. Each time the reel stops it will show a multiplier and as long as he keeps on spinning the reels, you’ll keep getting multipliers! These all add up and are multiplied but your bet before paying you the win (of up to x500)! During the normal game, the freefall bonus is always ready to give you wins and free spins. Whenever you spin the reels and you get a payout, the winning symbols that awarded the payout will explode! Other symbols will fall to fill their places. This will keep happening, as long as the symbols keep giving you wins! Every time this feature is triggered and new symbols fall, one of the arrows at the top of the reels will light up. There are four arrows and then three pots of gold. The three pots of gold give out free spins, so if you keep getting lucky and re-triggering this symbol, you could light up all the way to 10 free spins! When you get the first pot of gold, you’ll get 5 free spins. When you win the second pot of gold, you’ll get 7 free spins. When you win the last pot of gold, you’ll get 10 free spins! During the free spins, more Wild symbols are added to the reels – these are the card symbols with a four-leaf clover on them. You can win additional free spins through the Freefall bonus, just like in the normal game.